gion in the C-domain (residues 180-330), and the phosphate sensor domain (residues 163-182). 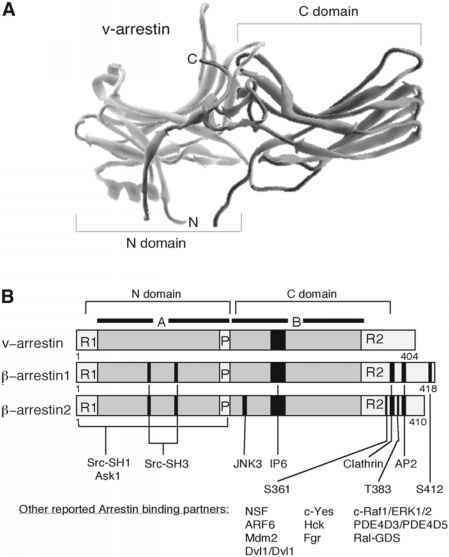 Data obtained from visual arrestin-P-arrestin 1 chimeras indicate that the specificity of receptor recognition resides within residues 49 to 90 and 237 to 268 of visual arrestin and the homologous regions of P-arrestin (25). Interactions among the polar core, the C-terminal tail, and the phosphate sensor region maintain arrestin in the inactive state. Upon binding to an activated receptor, the phosphorylated receptor tail is believed to invade the polar core, displacing the arrestin C-terminus and allowing for conformational changes that promote tight binding to the receptor (26). Consistent with this model, mutations in arrestin or P-arrestin that disrupt intramolecular interactions within the polar core produce arrestins that bind with high affinity to agonist-occupied GPCRs without requiring receptor phosphorylation (27,28). As noted, it is the C-terminus of the P-arrestins distal to the globular C-domain that confers properties lacking in visual arrestin. This region of the protein contains two well-defined motifs that link P-arrestin-bound GPCRs to the clathrin-dependent endocytic machinery. A LIEF/L sequence located between residues 374 and 377 of P-arrestin 2 binds to a region located between amino acids 89 and 100 of the N-terminal domain of the clathrin heavy chain (16,17). Additionally, P-arrestins bind directly to the P2-adaptin subunit of the heterotetrameric AP-2 adaptor complex through an RxR sequence, located at residues 394 to 396 of P-arrestin 2 (18-20). The AP-2 complex links many receptors to the clathrin endocytic machinery by binding to clathrin, dynamin, and EPS-15 and is involved in the initiation of clathrin-coated pit formation (29). Both interactions appear to be important for efficient P-arrestin-mediated GPCR internalization (19,30). Fig.1. The alternative fates of ligand-occupied GPCRs. Upon binding agonist (H), GPCRs undergo conformational changes that initiate heterotrimeric G protein activation and signaling through G protein-regulated effectors (E). Alternatively, receptor phosphorylation by second-messenger-dependent protein kinases (PKA, PKC) produces heterologous desensitization, whereas phosphorylation by GRKs promotes arrestin (Arr) binding and homologous desensitization. Once bound to the receptor, ß-arrestins engage the endocytic machinery and target desensitized GPCRs for clathrin-mediated sequestration. 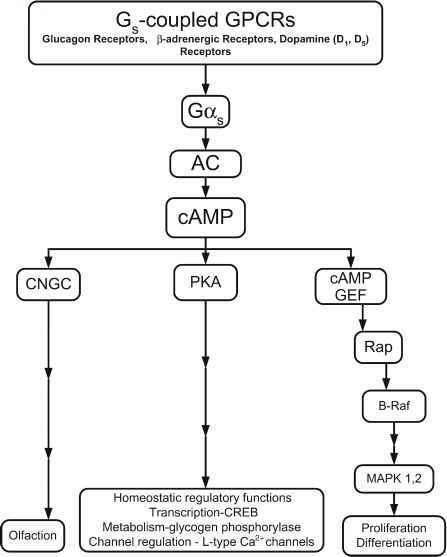 By acting as adapters or scaffolds, ß-arrestins also recruit signaling proteins, such as components of the ERK1/2 MAPK cascade (Raf-1, MEK, ERK1/2) to the receptor to initiate a "second wave" of GPCR signaling through protein complex assembly on the desensitized GPCR. (B) domain responsible for secondary receptor recognition, the phosphate sensor phosphoinositide-binding region of P-arrestin 2 resides within residues 233 to 251. Mutation of basic residues within this region produces a protein that translocates to the membrane but that fails to target p2-adrenergic receptors (ARs) to clathrin-coated pits, thereby inhibiting endocytosis of the receptor. The N-ethylmaleimide-sensitive fusion (NSF) protein also binds to P-arrestin 1 in vitro and in vivo (32). NSF is an adenosine triphosphate (ATP)ase involved in intracellular transport. Overexpression of NSF enhances P2-AR endocytosis in HEK293 cells, which suggests that the interaction between P-arrestin and NSF is important for receptor endocytosis. P-arrestins also form complexes with the small GTP-binding protein ARF6 and the ARF guanine nucleotide exchange factor ARNO (33). Expression of constitutively activated or dominant inhibitory mutants of ARF6 inhibits GPCR internalization, whereas overexpression of ARNO enhances GPCR internalization, suggesting that these interactions also contribute to P-arrestin-mediated endocytosis.